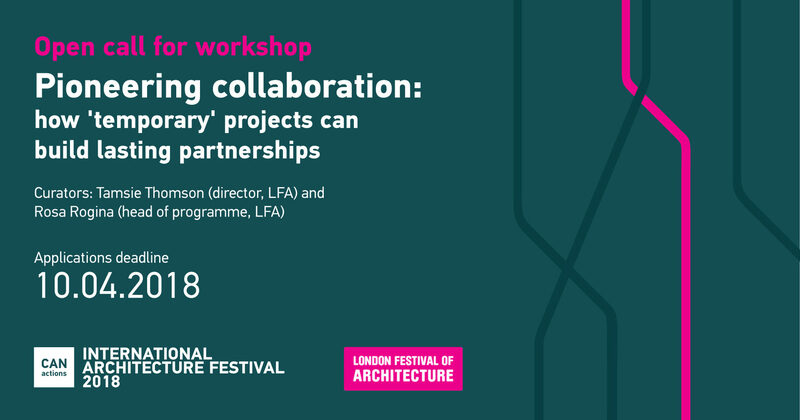 The London Festival of Architecture (LFA), building up on the success of the Dulwich Pavilion in 2017 and other temporary projects, will host a workshop on how to set up a project that can serve as an ideal platform for cross-disciplinary cooperation between an emerging architecture practice and a prestigious public institution. The workshop will be run by Tamsie Thomson (director, LFA) and Rosa Rogina (head of programme, LFA) who are both hugely experienced in running international and collaborative projects. The London Festival of Architecture (LFA), now in its 14th year, is Europe's largest annual architecture festival that features hundreds of events all over London from 1-30 June, with other activities also taking place throughout the year. It is a unique annual event that brings together key government figures and opinion-formers, world-renowned cultural organisations, every corner of the architectural profession and a broad public audience of over 400,000 people. LFA is committed to testing ideas and providing creative solutions within our built environment. In previous years, these have included the temporary closure of Exhibition Road, a heavy traffic road in London's Museum Quarter in West London, with several installations, which led to its eventual transformation into one of London's most successful public spaces. This and other interventions not only left a built legacy in the city, but also benefited both architects and public institutions by providing opportunities for collaboration between different types of organizations. 20, 21, 2018 in Kyiv. The organizer provides all the participants from abroad and other cities of Ukraine (except from Kyiv) with the hostel accommodation.